First, you may have noticed that I have reinvented my own nail shape! I have been wanting to take the plunge and go round for quite a while now and I thought this would be a fitting time. I'll be able to refine the shape a bit more as my nails continue to grow, but I am happy with the way the round shape looks on me! I know I can always go back to square, so that's a nice safety net too. Second, I thought it would be fun to reinvent the splatter manicure. I love splatters but they can be a bit unpredictable at times and are definitely messy. I started with a base of Essie Blanc, and then painted two coats of Orly Glowstick, a neon yellow, over the top. 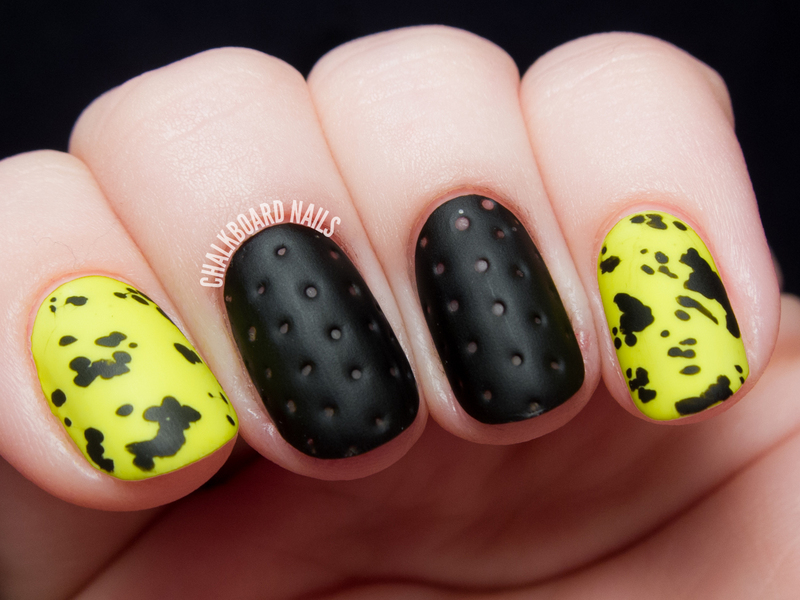 Then using a small nail art brush, I freehanded black splatters over the top with American Apparel Hassid. Finally, I tried to reinvent the idea of nail texture. I've seen some great examples of 3D textured nails that were created without texture polish like The Polishaholic's quilted manicure and Nina Nailed It's cable knit sweater nails. For my accent nails, I created a perforated leather effect by pressing a dotting tool into semi-set polish. I later did some googling and learned that I wasn't the first to come up with this effect; check out The Daily Varnish and The Beaulieu Review! Here is the step-by-step on the perforated leather nails. Paint your nails with two or three coats of whatever color you want the leather to be. Apply a thick coat of quick dry topcoat and give it 20-30 seconds to set. I used Seche Vite. Apply two thicker coats of matte topcoat and give it 30-45 seconds to set. I used OPI Matte Topcoat. Using a large dotting tool, press down into the semi-set polish. You want to press with medium, consistent pressure all the way down to the nail. Work two or three nails at a time so the polish doesn't set too fast. If you are having trouble with the dotting tool pulling up the partially set polish, wet the end to keep it from sticking. You will need to continually repeat this throughout the process. 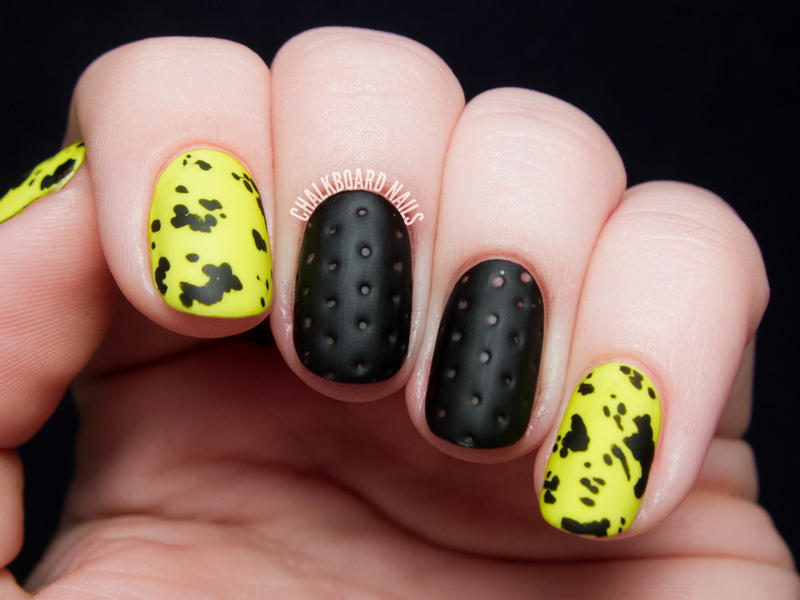 If your matte topcoat is leaving bubbles in the centers of the perforated holes, dip a small nail art brush in acetone and use it to gently erase the bubble. I'm so so happy with the way these came out, and I can't wait to continue using this technique. If you are participating today, make sure to hashtag with #LLreinvention. If you missed this month's prompt, be sure to keep up with The Lacquer Legion on Facebook and join us next month! That is brilliant! Did you get the splatters by dabbing the brush? Woah, that's a great look! Love the "splatter" on that neon base :). Wow!! I love this, I have to give it a try. Thank you for sharing the instructions. Love this! Great contrast between the black and neon! This looks so cool! The colours go great together and it looks so edgy! These look so great! I hadn't heard of this technique before but it's definitely something I'll try out! I love this! I especially love the "faux splatter" nails. Glowstick is such a fun color. Hubby has been bugging me to buy it for the longest time. Maybe I should give in; I love that color! Wow, great idea & color combo! Love these! They look incredible. Gorgeous colors! And love the perforated nails! I love this! The new splatter style reminds me of Dalmatian spots! This is awesome!! Love the leather look!! I love the perforated leather thing! Very cool. I reinvented my nail shape for this challenge as well! Roundies unite (for now)! OMGosh this reminds me of the gawd-awful most uncomfortable and incredibly hot splint I had to wear on my wrist recently...it is black neoprene with air holes all over it. I took a pic of it to show some friends on facebook and one friend responded 'well at least it has polka dots so it's stylish'. I about fell off of the couch laughing LOL. It did look like polka dots though...but it was my pale skin showing thru the holes in the pic...you couldn't see it irl though, it just looked like holes LOLOL. I still giggle about it when I see the splint LOL. Wow, these look fantastic! Need to try!!! Really love the texture on those! Adds lots of dimension. J'adore ton interprétation, c'est magnifique ! Whole mani is a complete package. It actually balanced each other :-). My daughter also experience with nails. She made my nail pastel, very nice. Would've never thought to use my dotting tool for something different. Cool! I just love this so much! Incredible! You might not be the first one with this technique, but you surely are the best. (I checked the other blogs)!!! Stick with the round shape. Your nails look great like this, and I just love this design. Thanks for sharing how you did it with us.